Brush large bowl with oil. Mix warm water and honey in stand mixer with a dough hook. Sprinkle yeast over; stir to dissolve. Let stand until mixture bubbles, about 5-10 minutes. Add flour, 4 1/2 tablespoons of oil and salt. Turn the mixer on low speed and let mix. Once mixed together, turn up the speed to meium-low and let knead for about 4-5 minutes. Transfer to prepared bowl, turning to coat with oil. Cover bowl with plastic wrap (or towel). Let dough rise in a warm draft-free area until doubled in volume, about 1 hour. Divide dough into 8 equal portions; roll each into ball. I like to freeze these so we always have dough on hand. To freeze, add a small amount of oil to a quart size freezer bag and add one dough ball. Roll out air and seal bag. Add all the zipped bags into one larger freezer bag and freeze. To use, remove from freezer several hours prior to cooking. 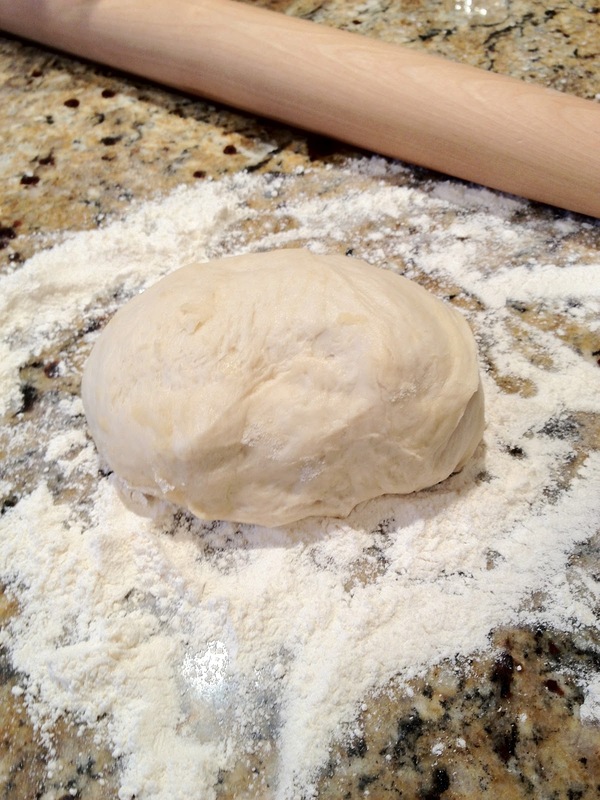 When thawed, roll out as you would with fresh dough. Heat pan to medium heat. Add olive oil and garlic. Saute for one minute. Toss in the basil on top of the garlic. Add tomatoes. Let simmer for 5 minutes.